Our copper sun wall art, at 40 inches by 40 inches, is an impressive piece that honors the natural world. This handsome sun art is intricately detailed with an expressive face, and would be a wonderful addition to your indoor or outdoor decor. With a more magical and old-world looking piece of garden art, this sun design works very well with either casual or more formal patio furnishings and natural greenery. The easiest way to bring Sun all year long into your home and garden is with a fabulous piece of Sun Decor. Our spectacular Copper Patina Sun Wall Art will absolutely blow you away. 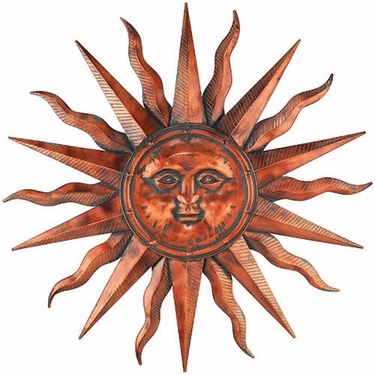 Our copper sun sculpture makes a beautiful and unique housewarming or wedding present for a special couple. Size: 40" x 40" inches.